The United States remained the world's top producer of petroleum and natural gas hydrocarbons in 2015, according to U.S. Energy Information Administration estimates. U.S. petroleum and natural gas production first surpassed Russia in 2012, and the United States has been the world's top producer of natural gas since 2011 and the world's top producer of petroleum hydrocarbons since 2013. For the United States and Russia, total petroleum and natural gas hydrocarbon production, in energy content terms, is almost evenly split between petroleum and natural gas. Saudi Arabia's production, on the other hand, heavily favors petroleum. Total petroleum production is made up of several different types of liquid fuels, including crude oil and lease condensate, tight oil, extra-heavy oil, and bitumen. In addition, various processes produce natural gas plant liquids (NGPL), biofuels, and refinery processing gain, among other possible liquid fuels. In the United States, crude oil and lease condensate accounted for roughly 60% of the total petroleum hydrocarbon production in 2015. An additional 20% of the U.S. production was natural gas plant liquids. Biofuels and refinery processing gain make up most of the remaining U.S. petroleum and other liquids production volumes. Throughout 2015, U.S. crude oil prices remained relatively low, with the spot price of West Texas Intermediate crude oil declining from $47 per barrel in January to $37 per barrel in December. Despite low crude oil prices and a 60% drop in the number of operating oil and natural gas rigs, U.S. petroleum supply still increased by 1.0 million barrels per day in 2015. U.S. natural gas production increased by 3.7 billion cubic feet per day, with nearly all of the increase occurring in the eastern United States. Increases in U.S. petroleum and natural gas production over the past several years are directly attributed to production from tight oil and shale gas formations. Several factors kept hydrocarbon production increases in Russia smaller than increases in the United States in 2015. Although Russian petroleum production continued to increase, natural gas production declined because of poor economic conditions and a mild winter, which resulted in lower domestic demand for natural gas. Russia's total combined production of petroleum and natural gas increased by just 0.1 quadrillion Btu in 2015. In contrast to past actions to raise or lower oil production levels to balance global oil markets, Saudi Arabia did not reduce petroleum production in late 2014 or 2015, even as oil prices fell and global inventories of oil rose. 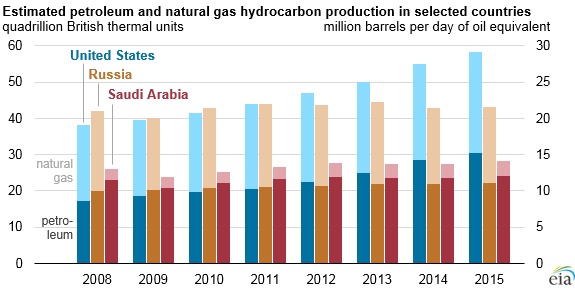 As a result, Saudi Arabia's total petroleum and natural gas hydrocarbon production rose by 3% in 2015. Still, the United States produced more than twice the petroleum and natural gas hydrocarbons as Saudi Arabia produced in 2015. In the May Short-Term Energy Outlook (STEO), U.S. petroleum and other liquid fuels production is expected to decline from 15.0 million barrels per day (b/d) in 2015 to about 14.5 million b/d in both 2016 and 2017. In contrast, STEO forecasts Russian liquid fuels production to remain at about 11.0 million barrels per day through 2017. STEO publishes a production forecast for Middle Eastern members of the Organization of the Petroleum Exporting Countries (OPEC) as a whole rather than for individual countries in the region. However, there is currently no indication now Saudi Arabia plans to reduce its current level of petroleum production.